About three weeks ago, when I decided to make this recipe, I bought an oatmeal raisin from Flour Bakery in the South End, luckily just a couple blocks away. It was a sturdy cookie, but flexible. Easily chewed – and I chewed quickly. The flavor was unbelievable. The sweetness was exposed with just the right amount of salt. And, most appealing to me – the taste of fresh nutmeg. Oh, yeah. Looking forward to this recipe. I cracked open the cookbook, read over the recipe, and followed the instructions word for word. Three hours with the dough in the fridge to firm (that was a brutal waiting game), 1/4 cup dough scooped onto a baking sheet (or the volume of an ice cream scoop). 19-20 minutes in the oven. 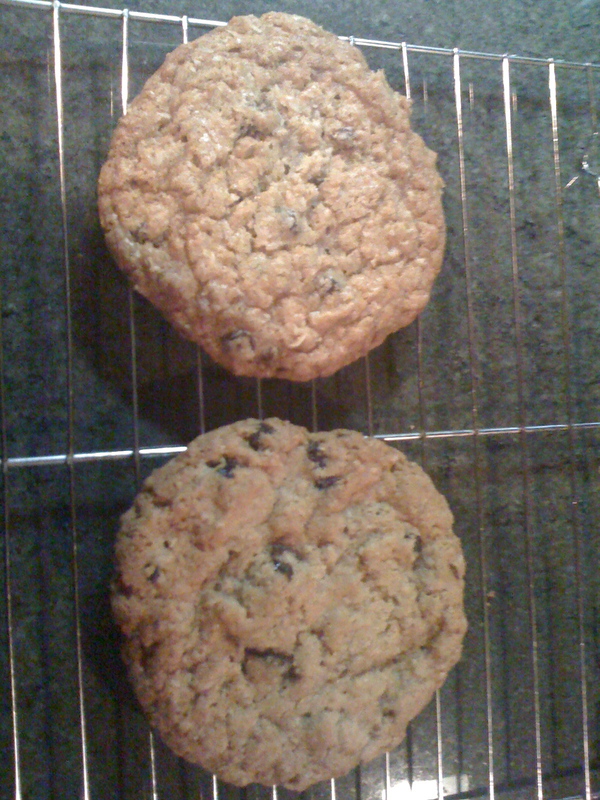 A couple of nibbles on the cookie dough assured me I was on the road to cookie oatmeal raisin perfection. What emerged from the oven was a cookie – yes. But it was a flat cookie. Not the sturdy cookie I had purchased from Flour the day before. They had spread too much and had cooked into each other. I can take blame for that last bit – I may have put my dough scoops too close together. BUT! why had the flattened into oatmeal raisin pancakes? You know exactly what kind of cookie I mean – flat, with remains of sugary bubbles on the surface. They tasted phenomenal, by the way, but come on, I followed the recipe word for word. . What happened? 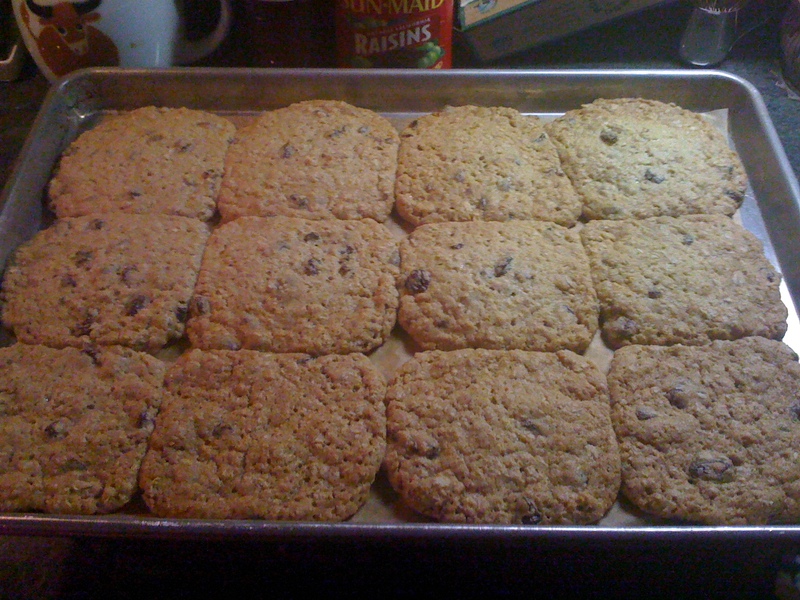 I did a little Googling, a little tweeting, searching for reasons why my cookies ended up like thin crisps. Baking soda. The problem lay in that little golden orange box. Expiration date: 2006. It has an expiration date, really? I mean, I knew it had a date on the box. But those dates are just … made up to cover their asses in a lawsuit or something. I don’t know what I thought. Apparently, my baking soda’s effectiveness stopped four years ago. What a knucklehead. 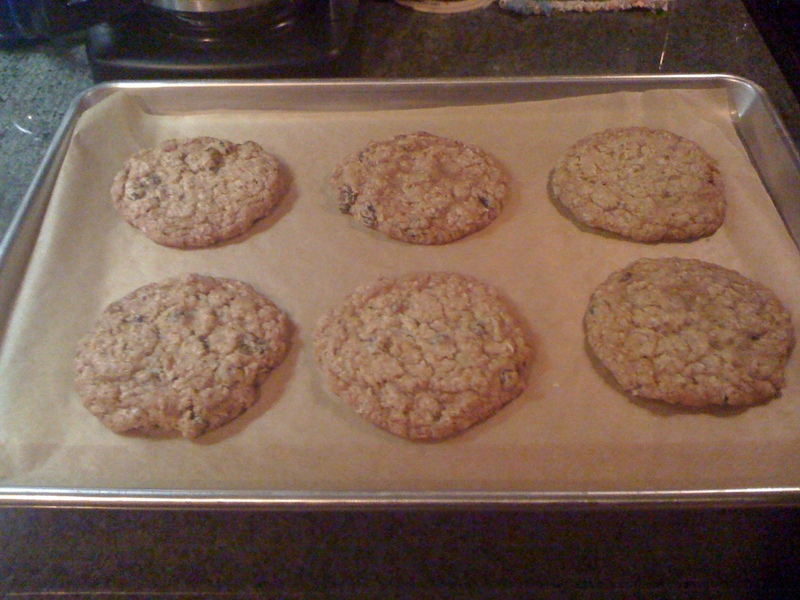 A fresh box later, my second batch of oatmeal raisin cookies turned out to perfection. Really. They were perfect. Again, I bought a sample from Flour to compare. Okay, so the original was perfectly round. And a tad bit lighter in color than my first half dozen – perhaps a minute less in the oven. But I have to say – comparing taste and consistency, my cookies certainly matched or exceeded Flour’s. Jennifer preferred my version – and she didn’t just say that because she loves me. Which one is mine, and which one is Flour's? Both are delicious. Four of these cookies became ice cream sandwiches last night for dessert. I scooped out … yikes, I’m looking through my measuring cups as a volume comparison … I’d say I put close to a 1/2 cup of softened French vanilla (from Whole Foods) between two of these 4-in. cookies and let them set for about hour. Firm cookie with firm, flavorful rich vanilla. I had been searching for cinnamon ice cream, but French vanilla was the perfect blank canvas I guess you could say to that featured the cookies’ profile perfectly. No photos available – the cookie didn’t last long enough. Most importantly, the point of this whole story isn’t that I made some really amazing cookies. The point for me is I had a success. In something. In a several week period where I’m feeling like an unaccomplished individual I did something right. I made something tasty. And although most of the Super Bowl crowd I hung out with last night didn’t eat my cookies, I felt pretty damn good about them myself. I may be a schlub when it comes to my day job, but I make a pretty fine ice cream sandwich. Jennifer just greeted me at the door with one of these cookies. UNREAL. I saw angels, I heard harps! I may be seen lunging down the hallway to offset the estimated one million calories, but every lunge will have been worth it. Delish! You are currently reading Oatmeal Raisin Cookies at The Dainty Dot.